Visionary leader, disruptive innovator, inspirational motivator, passionate environmental and equal rights champion, Emma is a 20-year food and beverage industry veteran and the current Managing Director of JRG Dubai - a Dubai Holding company - since 2015. In managing the Group’s brand portfolio of more than 18 award-winning food & beverage venues and international franchises, Emma spearheads the Group’s long-term commercial strategy and leads multidepartmental performance in everything from day-to-day operations and streamlining service standards, to driving new concept development, delivery and execution. In addition to breathing new life into celebrated Dubai institutions including Pierchic, Pai Thai and Al Nafoorah, Emma has proven equally adept at launching new-to-market brands and reinvigorating the Group’s legacy properties. In the last 18 months alone, Emma has overseen the arrival of Flow, the homegrown healthy eating and creative hub at Emirates Towers District, whilst also guiding the first major relaunch of the Group’s flagship The Noodle House brand, further improving the chain’s commercial revenues by implementing a state-of-the-art delivery hub and pioneering industrial kitchen. A true champion of green business ethics, Emma is steering JRG Dubai’s efforts to push industry-wide reductions in single-use plastics. That work began at home with Emma pledging to make all JRG brands ‘as plastic-free as possible’, largely by working with ethical suppliers of fully biodegradable consumables - specifically for the Group’s ever-expanding ‘grab and go’ and home delivery brands - to achieve her sustainability mandate. 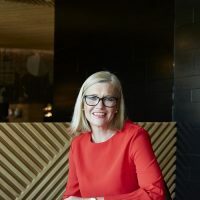 Far from being a savvy marketing campaign, Emma’s no plastics mandate has now become a Group-wide passion project, driving genuine change across the domestic food and beverage sector and cementing her status as one of the industry’s truly influential heavyweights. A self-confessed spinning addict, Emma starts most days with a gruelling session at Flywheel and spends her free time - Emma might add: “what’s that?” – relaxing at the beach, power-shopping at the mall or eating at JRG Dubai outlets with her husband, Jon, and teenage daughter, Lily. In rare moments of solitude, Emma throws herself into animal welfare initiatives – a lifelong love which has resulted in the extended family members of three rescue cats and a rescue dog called Bella.